Football players accused of violating teammate on "No Gay Thursday"
Three senior football players at a suburban Philadelphia high school have been charged with assaulting a freshman with a broom handle on what the team called "No Gay Thursday," a prosecutor announced Friday. The school investigation will "determine whether or not code of conduct violations occurred, the awareness and level of supervision provided by the coaching staff, and what further measures can promote inclusive and respectful behavior," Superintendent Richard Gusick wrote on the district's website, adding that students could face "firm but fair consequences." 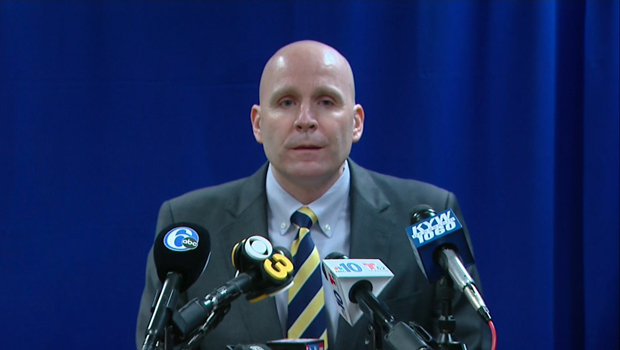 The 14-year-old told his father about the incident last month, CBS Philadelphia reports. The father went to the school district. The school district immediately alerted police and the DA's office. "This was generally upperclassmen doing this to the underclassmen. Bigger kids doing it to smaller kids. Hazing," he said. "It just happened to be a perfect storm of this 'No Gay Thursday' tradition and them not liking this freshman and taking it out on him in a pretty horrible way," he told the AP. "No Gay Thursdays" was a tradition started by the football team at least three or four years ago, in which behavior the team normally considered to be "gay" was considered "not gay" on Thursdays, Hogan said. He said the players also had a tradition of what they called "blessing each other," in which a student, with his hand spread wide, would hit another player on the backside or back with such force it would leave a five-fingered mark.